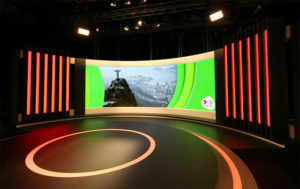 Australia’s Seven Network is utilizing an LED wall from VuePix for its Rio Central Studio set, located at NEP Studios in Sydney. “We needed to come up with a fully customized curved screen solution”, says Nathan Wright, VuPix product manager at ULA Group, the technology supplier and integrator on the project. “Our VuePix S1mm technology screen was an ultimate choice for the set, thanks to its high refresh rate it eliminates any problems with moare effect for cameras in TV environment”. The VuePix S series features Black LEDs, which provide a HD image with high contrast, deep blacks and vibrant colors. The slim line design with ventilation doesn’t require any fans for cooling, making the screen a good option for TV studios. The video wall is powered by Avid Everywhere.